Back when I was in the classroom I was approached by someone in our district who wanted me to submit some of my students’ artwork in a public showing. Normally I would be all over an opportunity like this. But this time the timing was all wrong. Much of the students’ best work was already on display at a local museum and so would not be available. Our open house was the same day as the deadline to submit work and I need to be sure the open house was strong. And to top it off, many students were in the final stages of preparing for the SkillsUSA California Championships. I did not need another thing on my plate. But I did not want to alienate the district person either. What to do? I turned it over to the students. I told them about the opportunity. I did not give them an assignment. I did not give them requirements. I didn’t tell them what they had to do. I told them what they could do if they wanted. It turned out they wanted to. Many students went the extra mile to produce pieces for the district event. Of course they did. They had spent the year experiencing success- public success- by doing the kinds of things they wanted to do, as opposed to doing the silly useless tasks I used to assign that nobody wanted to do. Including me. Giving kids a voice really brings out the best in them. This last week I was invited to attend some presentations in one of our elementary schools. The invitation was an opportunity to go and see how technology is being used in schools. On Tuesday morning I made my way over to the Primary Years Academy, pushed my way through a crowd of proud parents outside Ms. Matty’s first grade class, and was amazed. Kids were grouped around their little tables, in teams of two or three. Each table had a bunch of props representing aspects of the country the kids had researched. The kids were in costumes, respectfully representing the traditional clothing of that culture. Each team had a Chromebook the kids were going to use for their presentations. They were getting ready. “Hmmm, That’s not right” the boy said. “Try clicking here.” said the little girl. This went on for a few minutes before word spread among the kids on how to solve the problem. It was really impressive. Remember, these were first graders! Six year old kids! They had run into an unexpected problem, and were doing a fantastic job of problem solving. The kids solved the problem, and went on and gave their presentations to a room full of parents, and then repeated the performance for classes of older kids. The kids did a great job. I saw really wonderful presentations. Kids were using technology in an authentic way, blended with realia to make a meaningful learning experience. I just wish everyone could see what is happening in Ms. Matty’s room. Great things are happening in that class. Ms. Matty is my Edu-hero. Yesterday we held our annual SkillsUSA Regional Competition. For those that don’t know, SkillsUSA is a national student led career and technical organization. Students compete in career or leadership related events. Welding students, for example, are presented with materials and drawings and asked to produce the piece depicted in the drawing. Leadership students might present their student designed and implemented community service project. It is, I believe, a fantastic way to assess what students are learning in the classroom. Which brings me to the point of my blogpost this morning. The Washington Post this morning ran a story by Valerie Strauss called “How we teach kids to cheat on tests.” The story does a pretty good job of summarizing what happens when we put too much importance on the test score, or the quiz score. This morning Daniel Ching @danielpching published a blog post “The importance of process” in which he talks about the importance of providing feedback throughout the process of learning, and grading that process. Too often we educators put all of the grade on the final test, and the students loose out as a result. So lets go back to the SkillsUSA event yesterday. I was asked to run the Quiz Bowl event. This is sort of a “Jeopardy” type event where students, working in teams of 5, are asked a variety of questions. Questions include basic math, geometry, science, world and national politics, current events, and career related questions. It was fascinating for me to watch how students solved problems. Yea there were obscure questions where everyone in the room threw up there hands and said “whats a minority whip?” They were 10th and 11th graders after all. But for other questions it was interesting to me to watch the students break off into twos and threes and come up with their own answers, talk their way through the questions, and come to an agreement on the answer. I could easily see strengths and weaknesses for each student. More importantly the students could see their own strengths and weaknesses. They were arguing for their answers, and providing evidence to support those answers. Photo by David Varela. Used with permission. I learned much more about what these students knew by standing in the room and listening to them talk to each other than I ever would learn from the results of a test. Just as I learn more about what my students know by listening to them as they prepare for their presentations. My students typically participate in the Career Pathways Showcase. In this event they prepare a presentation where they demonstrate what they have learned. On Friday a group of students was preparing their presentation and one of them said “We should bring the books we read as evidence of our learning. We could talk about the books.” Another group decided to bring a stack of their mistakes, and talk about what they learned from them. I didn’t tell them to do these things, they decided it was the best way to demonstrate their learning. I think these SkillsUSA events are much better assessments of student learning than any test. So no, there is not going to be a quiz on this on Friday. Being proud and actually saying it. I was able to attend Fall Cue this year again. It was, as usual, a great experience. It was a little different this year in that I didn’t come home with a great new tool. Usually I learn of a great tool that is new to me; an app, a web site, or a gadget. This year there was no such discovery for me. The learning for me seemed to center on attitude. Mostly my own. I really wanted to refine my thinking about the maker concept and design thinking, and I was able to do that, but it wasn’t really new. The opening keynote by Ramsey Mussalum, which can be seen here, was great. Does Ramsey do anything not great? (Why do they call it the opening keynote when it is delivered at the midway point of the conference? But that is an aside.) Ramsey talked about why so many kids hate school, and to combat that we, as teachers, need to love our jobs. If you don’t love your job it shows, and you make it all the more likely that your students will #hateschool. Fortunately, #Ilovemyjob. The closing keynote by Angela Maiers was equally powerful. She talked about how kids just want to be acknowledged and valued. Call them by their name Angela said. All of them. Make them know you notice them. In a good way. One of the reasons #Ilovemyjob is because I work at a small school where I can know every kid’s name. We have less than 250 kids. I need to do better about knowing all of their names, even those who don’t hang out in Awesomnesity Central, or for those who don’t know, Room 17. I came back to school with the plan that I was going to seek out those kids who think #Ihateschool and say hello to them, by name. It seemed simple enough, and sounded like a pretty good idea. It was Tuesday afternoon, the last period of the day. I spent most of the day honestly amazed at the work my students were doing. We were doing some pretty complicated GIS stuff on a school network that doesn’t like GIS stuff. We had lots of issues, and the kids were just plowing right through them. They were almost finished with a project and I was just beaming with pride. I said it. One girl turned around and asked “Me? You are proud of me too? I am glad I went to Fall Cue. 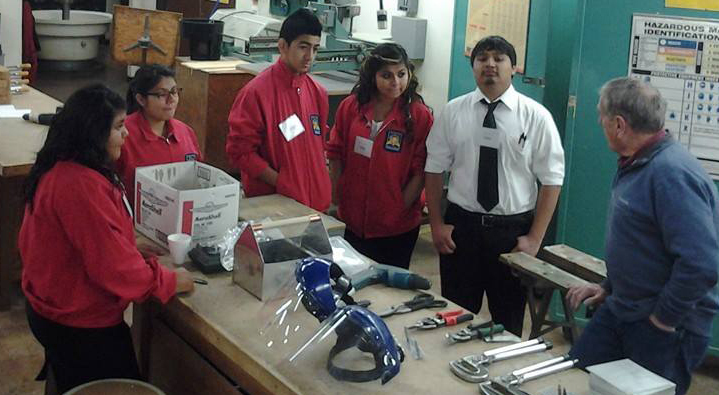 Last weekend I took some of my students to the SkillsUSA California Regional competition. I was particularly confident in my students’ abilities. A few students were in individual competitions, but most were in team events where they were presenting the different projects they are working on. I brought 21 students, and all 21 advanced to the state conference in April. Thats the largest number of kids I have brought to regionals, and thats the largest number I will have brought to state. After the event one student commented that was the first gold medal she had ever won in anything. Another asked if they get to keep the medals, or do they have to give them to the school. Some students wore them to school all week. I am very proud of the work and accomplishments of these kids, and I am really looking forward to the state conference. During the event one of the students told me “Mr. Hall I’m not going to lie. The only reason we took this project on is because we didn’t want to do all those other stupid projects, we’d rather do this. It’s easier to do something real.” I told him that I knew that. One reason I do Skills is it is a lot easier than grading all those other silly projects. It really is easier to do real world projects than “busy work” projects designed to “fill the year.” It is way more rewarding to. I came across this quote a few weeks ago on Twitter. It made me think about which of my kids are doing astonishing things, and which are not. The picture with this post is of my students giving a presentation to the school board. In the summer. After grades were turned in. They were finishing their project. I think that was astonishing. I have a bunch of kids doing astonishing things. But I have also been counting the number of kids who I am clearly not astonishing. Lets just say I do not have enough fingers to count that high. Even if I use my toes I come up far short. So I guess I need to, as my students would say, step up my game. I teach a technology class, and am fortunate that I have a very wide range of curricular choices. I can really take the class in directions that most teachers can not. I do not have a district mandated pacing guide. I do not have an end of year standardized test. So I really have no excuses, no road blocks. I have a very supportive site and district administration- they will allow me to do what I think best. They trust my judgement. But still, looking across my room I see kids who are not doing astonishing things. I guess that means I have room for improvement. I need to be more astonishing.